Occlusal Therapy is a generic term to denote a variety of procedures and appliances needed to improve or protect the masticatory system (teeth, muscles, jaw, joint), when occlusal disease is present and is causing damage to any part of the masticatory system. The main goal of occlusal therapy is to achieve an equilibrium or balance between the muscles, joints, and teeth, which is needed for ideal function, health and stability. Occlusal therapy can include, occlusal analysis, orthodontics, the replacement of inappropriately shaped restorations (fillings, crowns, bridges, ect ),equilibration, appliances such as splints and night guards are used to help properly align the teeth for Occlusal Therapy. What are symptoms that you may require Occlusal Therapy? 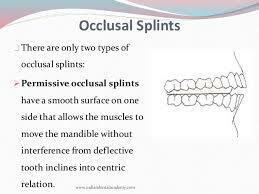 Occlusal Disease may be caused by one or several factors. Anyone experiencing constant jaw discomfort and pain, chipped or fractured teeth, or chipped or fractured dental work (crowns, bridges, or fillings), frequent unexplained headaches, notches in the teeth near the gum line, sensitivity to hot or cold, and if you clench or grind your teeth. Occlusal disease is a destructive process that can result from a bite in which the teeth are not properly aligned. Forces are applied to the teeth every time they meet. When the teeth are properly aligned, teeth, muscles, which work the jaw and the jaw joint, are designed to withstand these forces. How Do You Treat Occlusal Disease? Occlusal disease can be caused by many different things. Therefore, no two patients’ treatments will be exactly the same. Because bruxism is one of the most common causes of this condition,your dentist may recommend a custom-created mouth guards. These custom-made devices will fit securely around your teeth to prevent them from touching. You will typically only need to wear your mouth guard at night. If missing or compromised teeth are the root causes of your occlusal disease, your dentist may recommend restorative treatment. Through a variety of procedures, you can repair your teeth and balance out your bite. Common restorative treatments for occlusal disease include crowns, bridges, or dental implants. 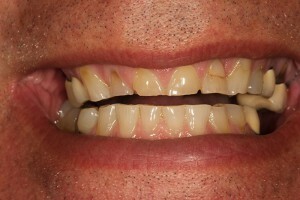 Invisalig, can also realign your bite to even out the pressure on your dental arch. In severe cases, you may benefit from a full mouth reconstruction. Reconstruction allows you to mix and match several restorative procedures to meet your individual needs. This treatment can have enormous benefits for your appearance and self-confidence, as well as for your oral health. Finally, cosmetic treatments can restore the appearance of your compromised teeth. For example, veneers can cover up small cracks or worn edges.